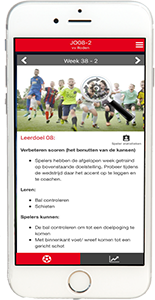 The Pro Soccer Planner is a continuous learning line for youth from 5 to 19 years. Coaches and players work together on concrete goals in an annual plan. Everything is covered: technology, tactics, physical and mental. The method supports over 700 ready-to-use training sessions. The experienced coach can create his own exercise with the help of the library in the Pro Soccer Planner. WHAT’S IN IT FOR YOUR CLUB? PRO SOCCER PLANNER gives VV Dieren structure and grip. All players have more fun in learning to play soccer better..